Today dawned brightly enough, but it was clear that the wind had increased overnight and was gusting quite viciously at times, so much so that the cushions from the sun-loungers had been blown around the garden. After having spent the day in the car yesterday I was determined to get back on the bike today, with an initial idea of doing a longer cycle through to St Didier and Venasque, before coming back up to Gordes via the Gorge and the Abbaye De Senanque (which is worth visiting at any time of year for its wonderfully calm atmosphere). A quick look at the weather showed a yellow warning for wind in place until tomorrow morning and the predicted strength of the gusts didn’t look too promising, this was reinforced by a comment on twitter to ‘stay low’ ‘Mistral gusting at 76kph’ . It was clearly time for a rethink. As my hubby suggested in our chat on Skype this morning, it’s best to head into the wind on the way out, at least then you’ll be blown back, so I decided I’d head towards L’Isle Sur La Sorgue, which has a Thursday market, but was also in the right direction – and as you’ve probably gathered by now the Provencal Markets are a passion of mine. Even I felt I had to wear another layer today, so I got dressed up and headed off. To say some of the gusts were strong was an understatement and at times it felt as if I was having to pedal just to keep moving at all, even on some of the slight downhill stretches. Luckily though, it is possible to go from Maubec to L’Isle Sur La Sorgue almost totally off main roads so I had a gentle, albeit rather slow cycle through. 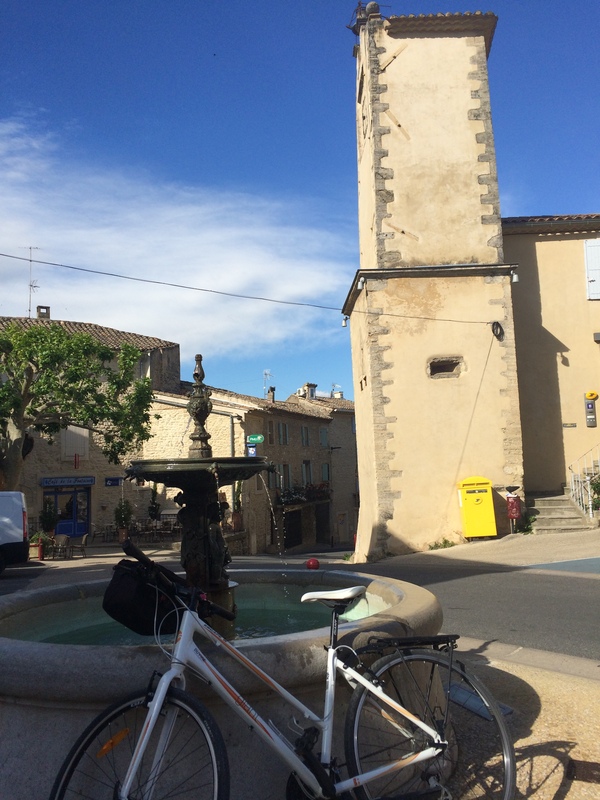 It also provided me with a perfect spot to have breakfast in the picturesque village of Lagnes, where I sat by the fountain with a ‘pain au chocolat’, bought from the nearby ‘Depot De Pain’. 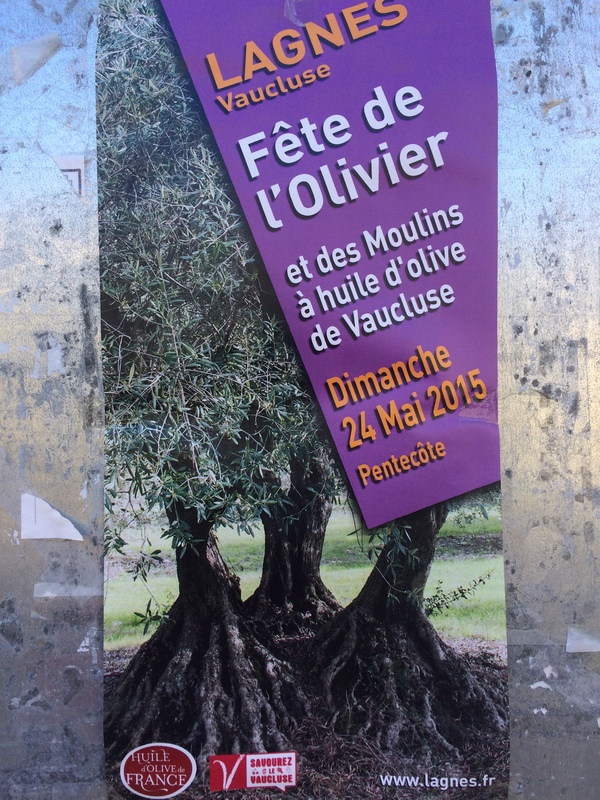 Lagnes is also hosting the ‘Fete De L’Olivier’ this Sunday, which will be worth having a look at if we are passing – the other events we have seen in Lagnes over the years are always great local occasions. 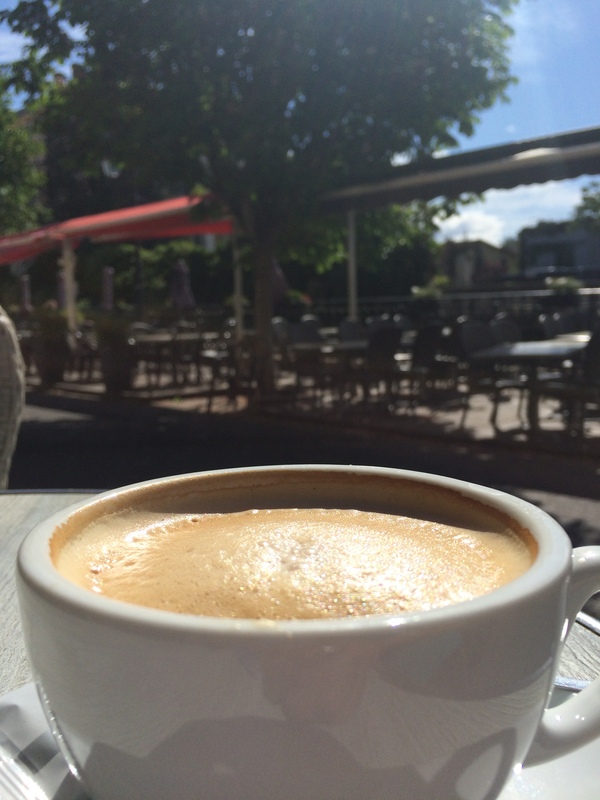 Arriving at the market I felt (and probably looked) rather windswept, so found a table in the sun, but happily out of the wind at the Café de La Sorgue, where I was able to catch my breath over a coffee and enjoy the view across the river. 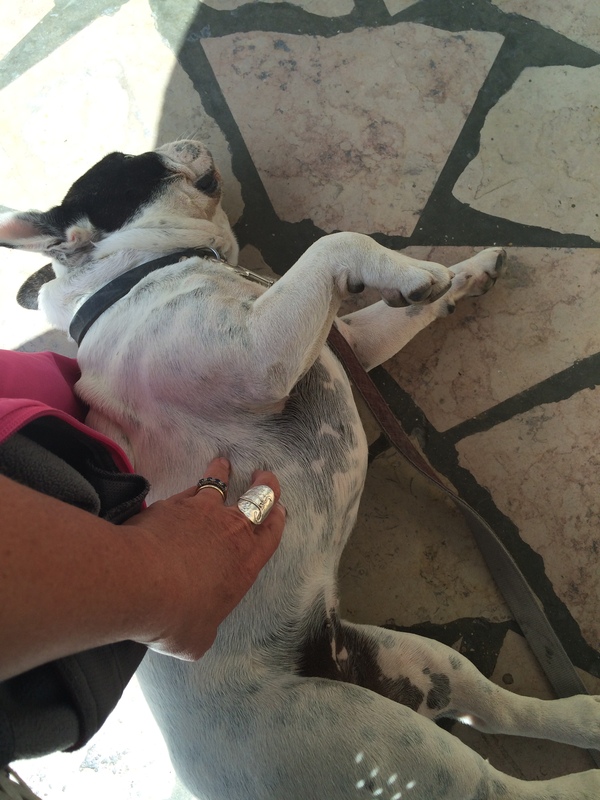 Whilst I sat there I managed to find a friend, who rather enjoyed having her tummy tickled, so much so that when I turned away she tried to climb on the chair with me. It was nice to be able to have a wander around the town when it was relatively quiet. The market on a Thursday isn’t as large and certainly doesn’t draw the crowds in the same way that the Sunday market does, so it is easier to see what lies behind the mass of stalls and people that are there at the weekend. My favourite shop ‘Cote Parc’ had a real menagerie in its pavement display. 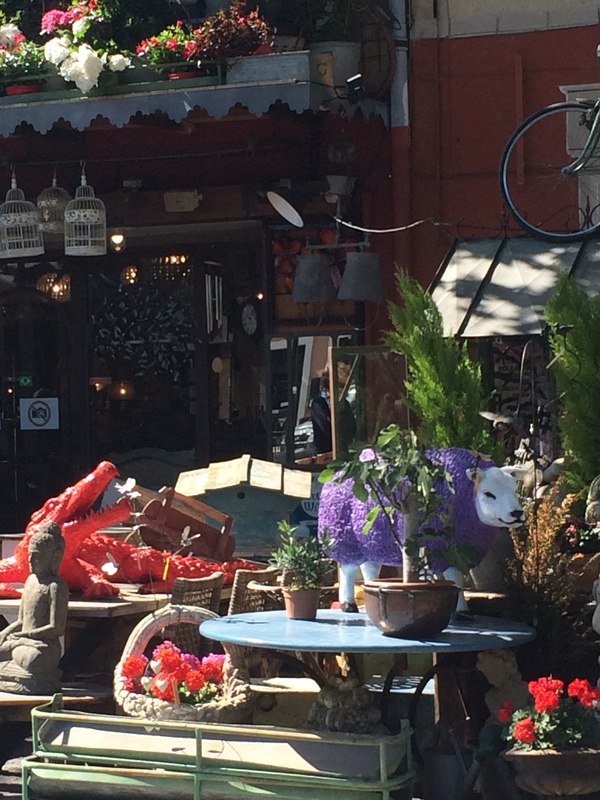 On Sunday there was a large grey fibreglass seal lying between some chairs, but today it was playing host to a brilliant red crocodile and a vibrant purple-fleeced sheep, amongst the stone garden-ware and geraniums (bizarre, but great). 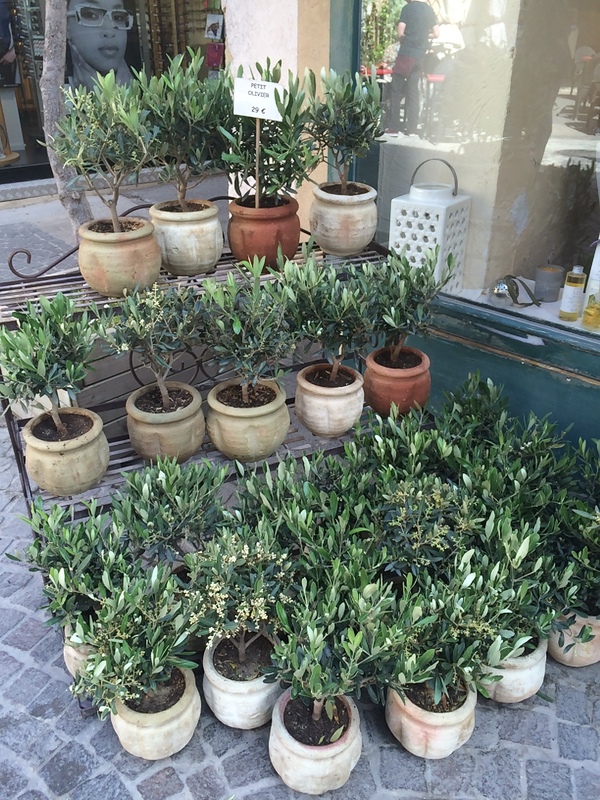 I also loved this simple display of miniature olive trees on staging in the main street – they always look so lovely. We have an olive tree at home on Dartmoor, she has managed to keep growing somehow, but I feel she really would thrive if ever we got the opportunity to relocate her to Provence. 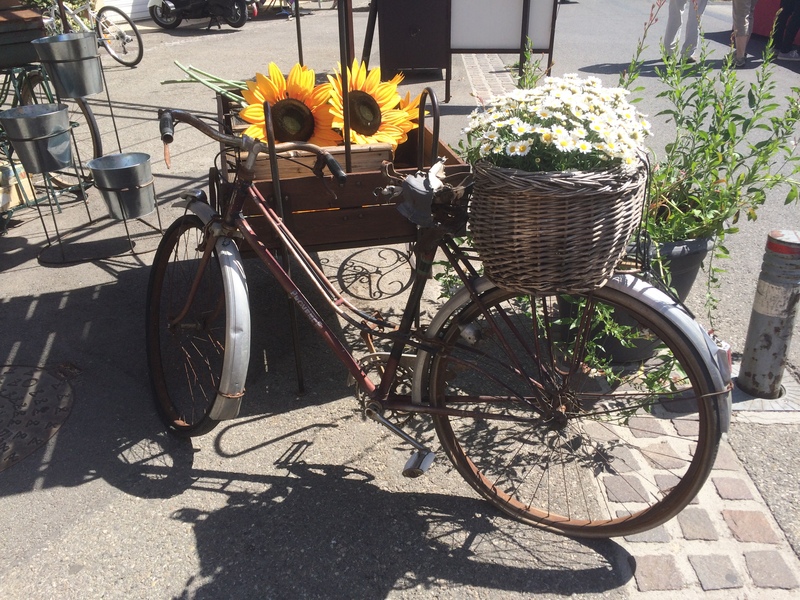 The florist along the riverbank always has lovely displays and today was no exception with an old bike carrying a basket of marguerites, standing in front of an old cart adorned with sunflowers, so pretty. 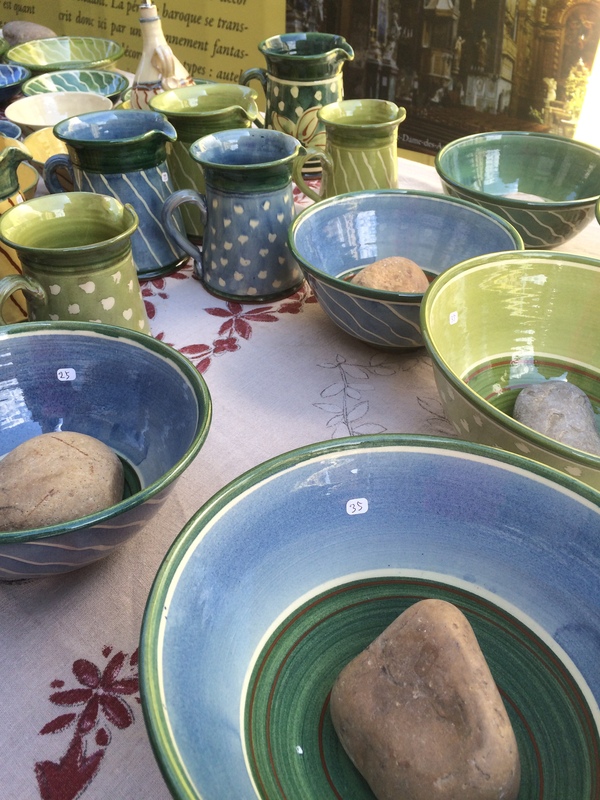 I was also rather taken with this pottery on a market stall in the main square, not something I had seen before and a bit different from the vivid colours I normally see. 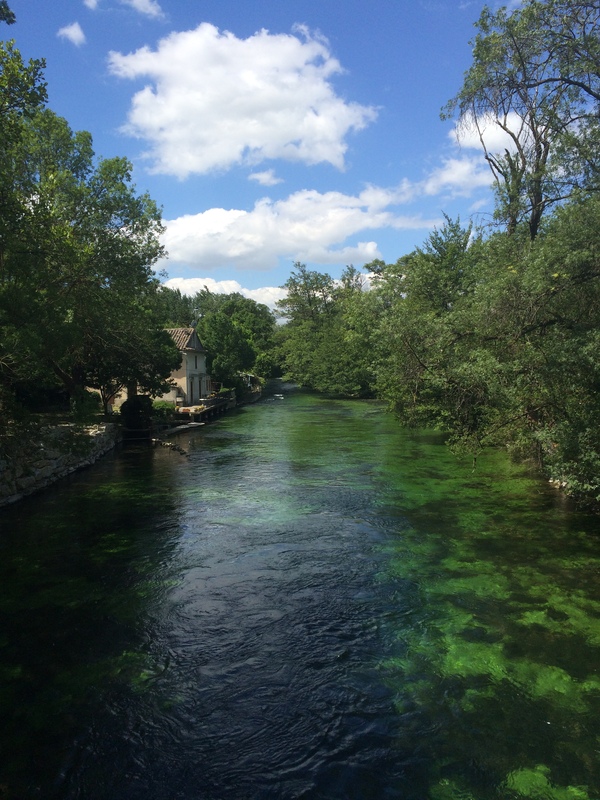 Again I managed to pass a couple of hours, by which time (if anything) the wind had strengthened so I decided to cycle back via the lanes again, on a route that takes me over the Sorgue, just below Fontaine De Vaucluse…. ……. And back through the cherry orchards, which are groaning with fruit at the moment. 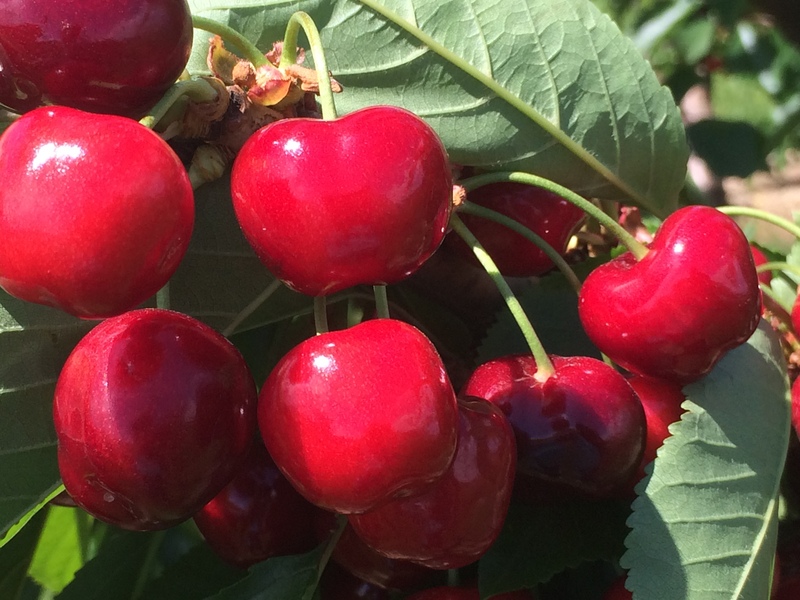 Cherry trees are full of fruit at the moment, so beautiful to look at and eat! 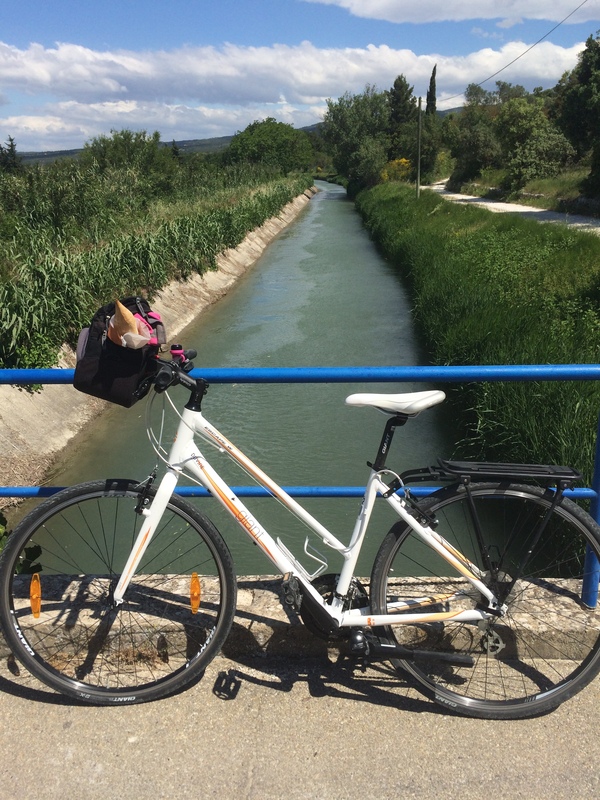 So despite the Mistral, I managed a cycle today – it may not have been what I originally planned, but getting out on the bike here is so enjoyable & just helps me get below the skin of the area in a way that isn’t possible behind the wheel of a car. 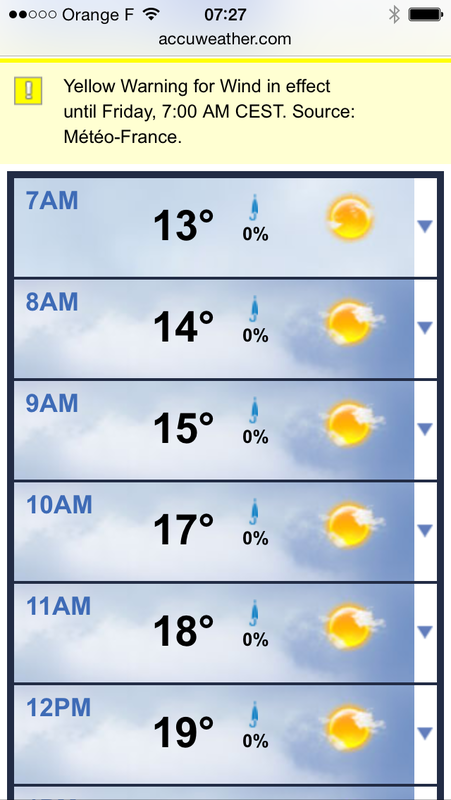 If the weather forecast is right the wind will have dropped by tomorrow, so perhaps I’ll have time for another brief excursion before I shoot off to meet my family and as they keep telling me my peace will be shattered!